"Gingivitis Is The Most Common Periodontal Disease Among Children"
Gingivitis is periodontal disease that causes inflammation of the gums. It is a mild form of gum infection that causes swelling and bleeding. However don't take it lightly, it can lead to bone destruction and tooth loss. 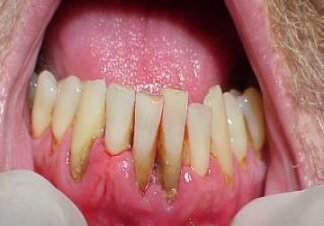 This disease is rarely painful in the early stages, consequently it often goes unnoticed until severe irritation or red swollen receding gums occur. It is a periodontal disease which involves inflammation and infection that destroys the tissues that support the teeth, including the gums, the periodontal ligaments, and the tooth sockets. If it is allowed to progress it will severely weaken the support structures of the teeth, and worst case, could even lead to pyorrhea or trench mouth. Most certainly it could cause you to lose your teeth, and require you to get dentures or implants. What Causes The Gum Infection And Inflammation? The simple answer is, not obeying your mother. I'm sure you were told to brush your teeth and gums morning and night and floss at least once a day. If you followed this simple advice you more than likely would not develop periodontal disease. It is caused by the long-term effects of plaque deposits. Plaque is a sticky material made of bacteria, mucus, and food debris that develops on the teeth when you don't care for your teeth regularly. It is a major cause of tooth decay and cavities. Plaque that stays on your teeth longer than two or three days can harden under your gum line into tartar. You usually can't get rid of tartar by brushing and flossing — you will need to have your teeth cleaned by a dental hygenist to remove it. Thats why dental professionals recommend a cleaning and check up every 6 months. Presumably because of hormonal changes. We do know that oral contraceptives may make inflammation problems worse. An estimated 98 percent of all young people have some degree of gum infection. Although gingivitis in children rarely causes a serious problem such as permanent tooth loss, it has a tendency to peak in severity at the time of puberty. Particularly if it occurs in people with minimal dental plaque. Periodontal disease may be passed from parents to children and between couples. Many people have gingivitis to a varying degree. It usually develops during puberty or early adulthood due to hormonal changes and may persist or return frequently, depending on the health of your teeth and gums. Whiter Teeth In 5 Days! No Dental Visits! Save $100's! This will also prevent tooth decay. This will help clear up the chronic inflammation in your mouth and in your whole body. Eat a variety of foods, but eat fewer foods that contain sugars and starches. These foods produce the most acids in the mouth, which begin the decay process. If you have to snack, brush your teeth afterward. Smoking cigarettes or using smokeless tobacco products increases your risk of oral cancer and cancers of the larynx, pharynx and esophagus; gum disease; as well as causes bad breath, tooth discoloration, and contributes to other oral and general health problems. What's behind these connections? Experts can't say for certain, but they believe that oral bacteria can escape into the bloodstream and injure major organs. Inflammation Is A Common Denominator, experts say. Periodontal disease, marked by inflammation, may increase inflammation throughout the body. Chronic inflammation , is a problem in many other diseases. When people have moderate to severe gum disease, their levels of C-reactive protein (CRP), a protein that rises during chronic inflammation, increase. CRP levels are also used to assess a person's risk of a heart attack. Gum disease treatment involves reducing the inflammation . The teeth are cleaned thoroughly by the dentist or dental hygienist to loosen and remove deposits from the teeth. Dentists Say: You Do Not Have To Brush Every Tooth--Only The Ones You Want To Keep!